MEMORABLE milestones, big goal hauls and the next generation of stars were among the memorable moments from the weekend (and early in the week). Steele Sidebottom has been a mainstay in the Collingwood lineup since his debut in Round Seven, 2009. On Sunday, his teammates showed their gratitude for his service over 200 games with a big win over rivals, Essendon. The Bombers led at both the main and final breaks by the narrowest of margins, but special efforts from skipper Scott Pendlebury and Jordan De Goey willed the Magpies over the line. The 2010 Premiership player and 2017 Copeland Medal winner has been in near career-best form this year, and it was no different this round as he collected 28 disposals, six marks and two goals to cap off his special day. It’s no secret that Lions fans have been excited about the potential of gun forward Eric Hipwood. As the mobile forward approaches 50 AFL games, he is really coming into his own and dominated on Saturday to boot 6.2 in a 65-point Brisbane win over cellar dwellers, Carlton. The Brisbane Lions Academy product clunked seven marks (six inside 50) in his 15 disposals, taking his season goals tally to 27 having played every game. 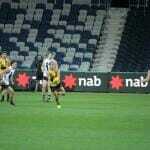 Fellow 2015 first round draftee Charlie Curnow also impressed with his three goals in a losing side. With a strong victory over country rivals Murray at a wet and windy Morwell Oval, Gippsland powered to clear second in the TAC Cup standings. 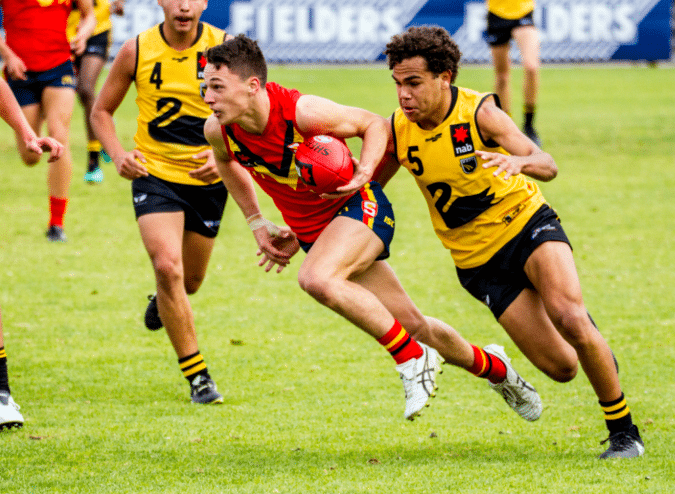 Vic Country representative Caleb Serong was back for a rare TAC Cup game and earned an AFL Draft Central Player of the Week nomination with his 23 disposals, five clearances and two goals. Others to contribute were Austin Hodge and Riley Baldi with 20 disposals each, while debutant Harold Hood caught the eye with his 16 touches. The Power are now a game clear of Murray, Western and Sandringham’s 28 points with a healthy percentage of 155.95 as they look to finish the season strongly. 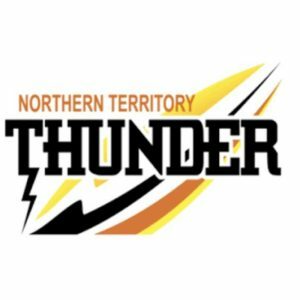 Division One of the Under 16 National Championships resumed on the Gold Coast with South Australia taking on Vic Country, while Western Australia battled Metro. The results confirmed that South Australian football is in very good hands as they accounted for Country by 42 points. 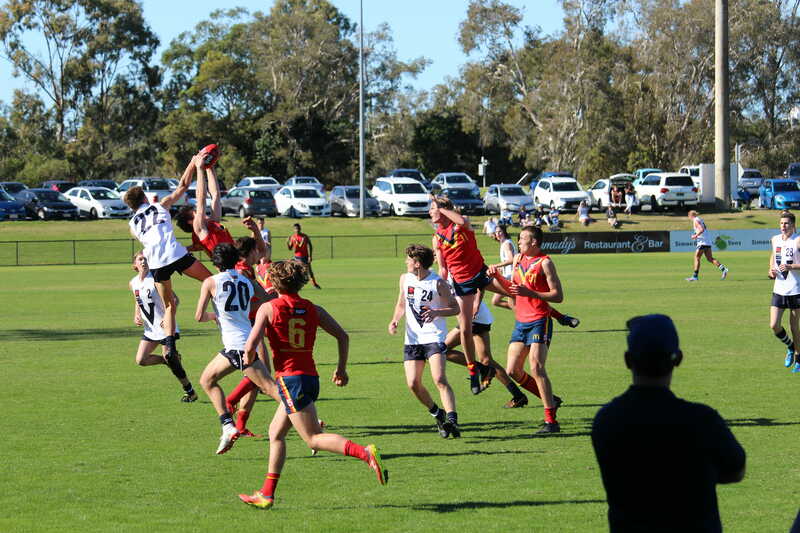 Star forward Kaine Baldwin was unbeatable in the air, while the likes of Kye Dean and Luke Edwards collected plenty of the ball. In the second game of the day, WA’s Logan McDonald booted six goals in a best afield display, while Taj Schofield and Zane Trew were outstanding through the midfield in a big win over Metro. The results suggest that the figure of over 50% of draftees coming from Victoria could well change in the near future, but there is plenty of time for bolters to make their run. 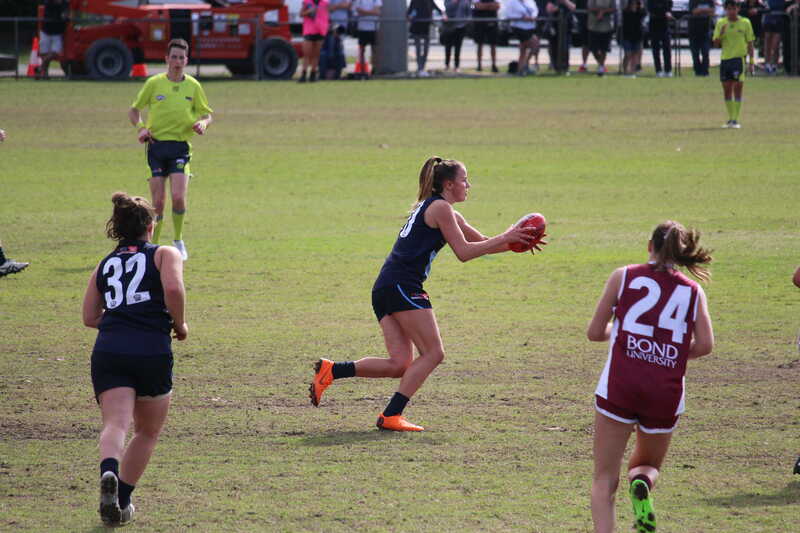 With the Under 16 Metro and Country boys getting worked over in their games, the Under 18 girls won some pride back for Victoria as both sides grabbed wins in their National Championship fixtures. Country stormed to a 56-point victory over Queensland on the back of Lucy McEvoy’s five-goal haul, with Nina Morrison strong through the midfield. Meanwhile, Metro remained undefeated with a hard fought 8-point win over Western Australia as the likes of Madison Prespakis and Northern Knights best and fairest winner Gabby Newton contributed well from midfield. On the second day, Metro went down to Queensland on Wednesday at Broadbeach, despite the best efforts of Prespakis, Eleanor Brown and Newton,, while Country got the job done against the Central Allies thanks to another four goals from McEvoy and top performances from Morrison and Sophie Van De Heuvel. Queensland was sensational in the win against Vic Metro, with the likes of Zimmorlei Farquharson and Lily Postlethwaite the top performers. 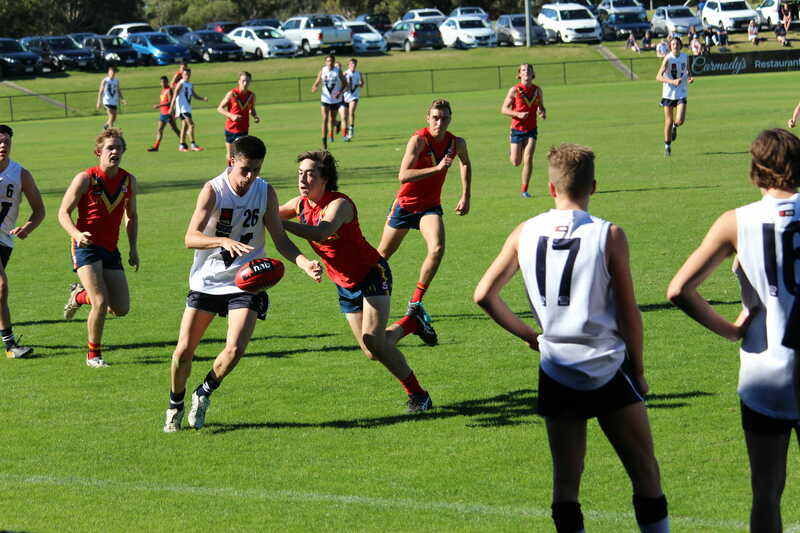 IT was an forgettable day for both Victorian sides in Round Two of the Under 16 National Championships, with South Australia and Western Australia flexing their muscles in impressive performances at Southport. South Australia opened their account with a 42-point win over Vic Country in what was a consistent team performance. The Croweaters were slow out of the blocks in a tight first term, but managed to keep their opponents goalless to hold a 14-point buffer at the first change. The game started to open up in the second term as Vic Country hit the scoreboard through a Noah Gadsby major, but Kaine Baldwin and Isaiah Dudley both hit back for SA as they held on to a 24-point lead at the main break. It was more of the same in the third term as both sides battled for any kind of momentum, with Vic Country drawing to within three goals, but none was forthcoming as they could only manage to go goal-for-goal. South Australia would have been content with proceedings at that stage, and went into the final term with a 26-point lead and the low-scoring result all but wrapped up. Dudley’s second and third goals extended the margin, with James Higgins chiming in with his second of the match to close out a solid victory for the South Aussies. Kye Dean was a key ball winner for SA with 21 disposals, six clearances and a goal, and was matched by Matthew Roberts who had five marks and five inside 50’s to go with his 21 touches. Potential Adelaide father-son Luke Edwards was solid in-close with 18 disposals, eight tackles and four clearances, while Baldwin marked impressively well to finish with seven along with 15 disposals and a goal. Dudley was zippy up forward alongside Baldwin, while Riley Thilthorpe made an impact with 16 disposals, 15 hitouts and four clearances. For Country, Tanner Bruhn was the standout with 24 disposals (16 kicks), four marks, four tackles, seven clearances and seven rebound 50’s in an awesome display from defence. Zavier Maher wasn’t far behind with 18 disposals, five marks and four clearances, while Gadsby also had it 18 times for six marks, six inside 50s and a goal. Sam Witherden – brother of Brisbane’s Alex – was also a settling influence in the backline with nine disposals, three marks and three tackles, and Jamarra Ugle-Hagan showed his athleticism up forward early on, despite only finishing with eight disposals and three marks. 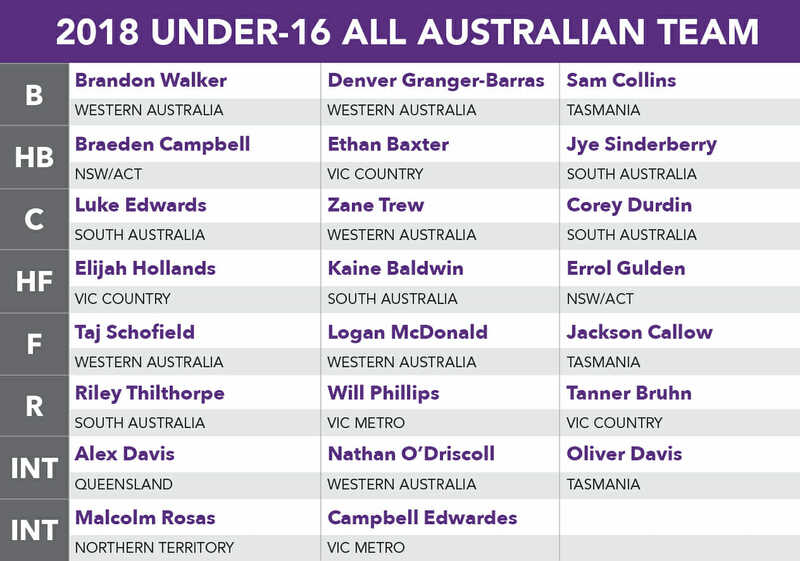 Western Australia ran rampant in their 74-point drubbing of Vic Metro, unearthing plenty of talent to look forward to in the coming years. The Black Swans were somewhat managed in the first quarter despite flashes of brilliance, but still held a handy 22-point lead at the first break on account of keeping Metro goaless. Star WA forward Logan McDonald booted his side’s opening four goals in what was a no less than special display of lead-up forward work. The West Australians went on to boot five majors in the second term, while Metro were wasteful with five behind accompanying Samuel Tucker’s lone goal on the scoreboard. It was more of the same in a dull third term as the Victorians could only manage a further six minors, while WA kicked out to a 51-point lead with two more goals. Inspired by McDonald’s exploits, Jack Allen found his way into the game with some solid overhead marking up the ground as both sides struggled to find their way into scoring positions. 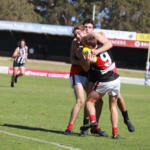 The final term saw Allen get reward for his third quarter efforts with a goal, while McDonald ended up with six in a damaging display that helped the Sandgropers to their 97 point total. Ruck/forward Michael Mallard was excellent and dominated in the air, while also giving zippy midfielders Taj Schofield and Ira Jetta first use on the deck. Midfielder Zane Trew was also outstanding with his aggression, marking and vision, putting WA into dangerous areas. Down back, Denver Granger-Barras put in an absolute shift, intercepting almost everything that came his way while creating rebound when with ball in hand. For Metro, skipper Ewan Macpherson tried hard all day and won his fair share of clearances, while fellow midfielder Lochlan Jenkins was also impactful. Talls Campbell Edwardes and Tucker also had their work cut out for them, but competed well in an effort to thwart WA’s aerial presence in a disappointing day for the Victorian side.